On the trips in 2011 and 2012 with I had my bicycle loaded with a variety of mismatching bags that I had bought for a few euros on various junk sales with the tent strapped on top of the rear rack. Later I got a cheap handlebar bag to help balance out the weight in the front. Mimi carried a plastic crate on her bicycle's rear rack with a backpack in it and a metal basket attached to the front. On our trip around the island of Texel we got caught in a sudden shower. We tried to find shelter as soon as we could. Mimi had brought some garbage bags to cover the bags with, but putting those over took too much time. At our campsite that evening we discovered that the pillows acted like a sponge, and because they were tightly packed inside the bags any moisture is immediately absorbed. 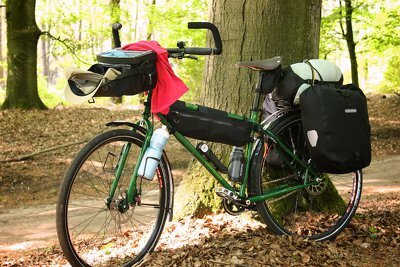 I hung as much stuff as I could to dry on the bicycle that now acted as a drying rack, trying to to catch the last rays of sun as it quickly disappeared behind the trees. After that I parked the bicycle next to the barbecue hoping they would dry a little bit more while not getting too much of a smoky smell. Shortly after this trip it was decided we were going to get some waterproof bags that seemed ridiculous and overpriced not so long ago. Bicycle with hazel colored Back and Front Roller Plus panniers. 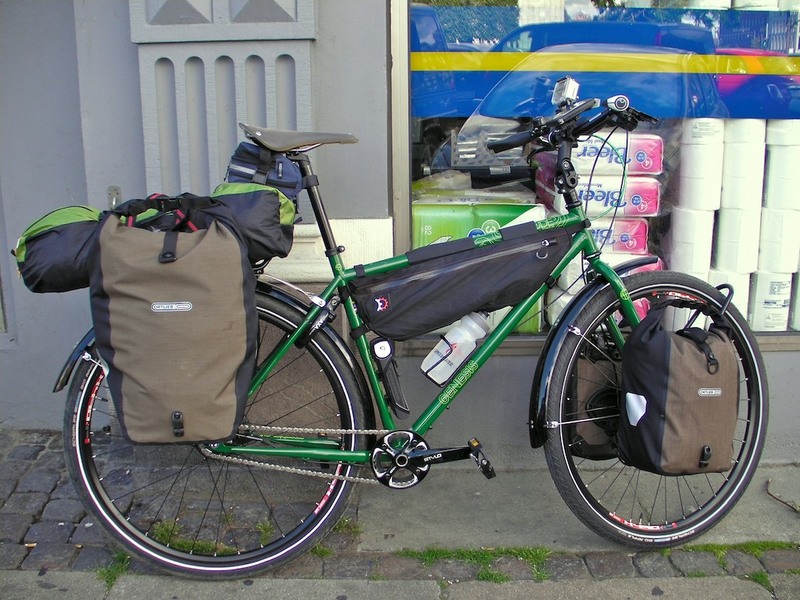 Bicycle with Black Back Roller Plus panniers. 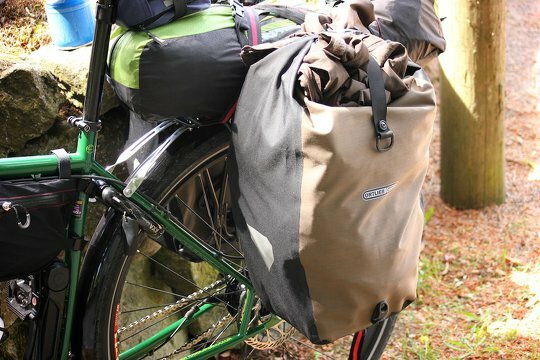 There are various brands out there with some waterproof panniers. 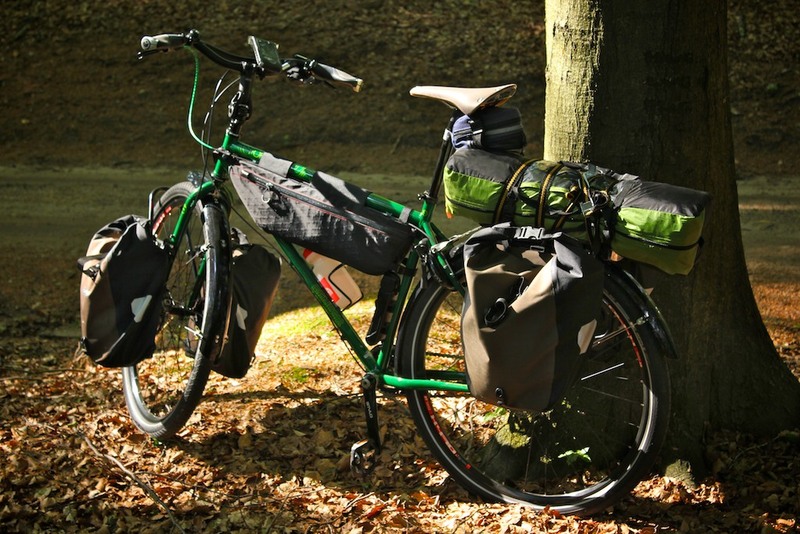 Some of them include Arkel, Vaude, Brooks and Thule. Although Ortlieb has a reputation for being expensive, bags from many of these manufacturers are similarly priced, or even higher. I didn't really like the Vaude bags, since I read several reports about the hooks of the panniers not being reliable. I do like the way they click, but if you forget to click them on, or if the mechanism breaks the bags can fall off while riding. Included shoulder strap and clips allow you to stuff much more in the bags than with the city variant which requires you to pull down the hooks all the way. Though both rated at 20 liters, the difference in capacity is quite significant. 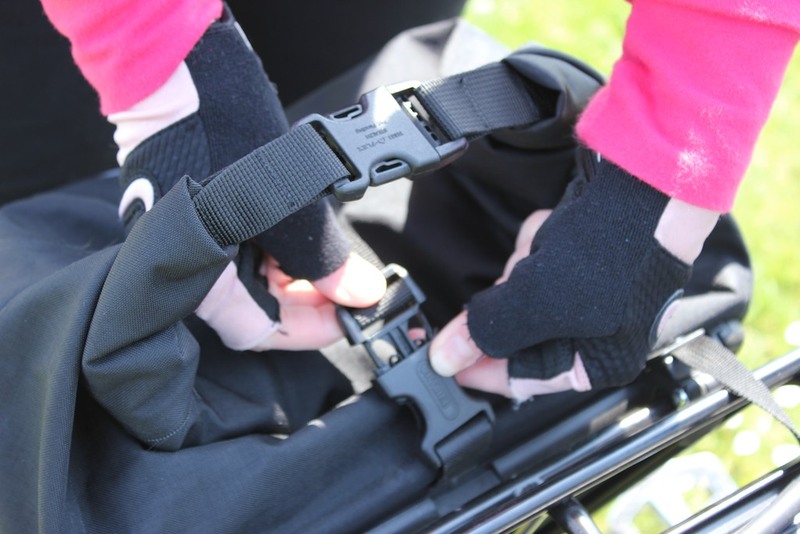 The Quick Lock 2 system is more adjustable that the Quick Lock 1 system that the other bags use. On our bicycles the heel clearance is something we need to take into account, and the Quick Lock 2 system allows you to easily move your bags a little bit more towards the back. The bags can be locked to the bicycles. 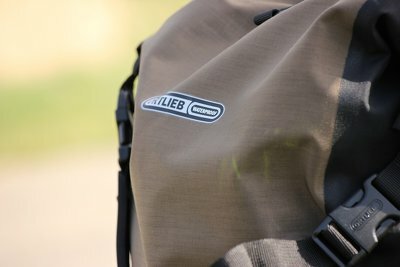 Ortlieb sells some locks that allow bags with the Quick Lock 2 system to be locked to the bicycle. Of course it won't stop a professional, but it will make our trips a little bit more free worry free. Lighter, more durable and pliable material. The main difference Plus and Classic product lines is the material. The Plus bags are made out of PU-coated Cordura, which the call PS36C. Most other bags in Ortlieb's line up are made out of materials that are coated with PVC. The main difference is that it is more environmentally friendly, lighter, stronger, and more expensive. For most people the main difference will be in the looks. The Plus version is less shiny, and the material is more pliable, while the PVC bags get softer when it gets warmer. The Plus bags are always easy to roll up. This maybe especially useful in colder climates. Most of Orlieb's waterproof bags were traditionally made with PVC. although Ortlieb manages to keep the production process relatively harmless for the environment, the bags still contain PVC. The Plus panniers use a different material that is lighter yet still waterproof and durable. It doesn't matter much in weight, because there is an extra inside compartment and outer straps, but after seeing and feeling it I really liked it more, it looks better, less shiny too. The Cordura on the outside has a nice matte texture. The outer layer of Cordura does absorb some water, but the inner layer of polyurethane keeps the water out. The lightweight and pliable material of the Plus bags means that they won't keep their shape when they are empty, you can't set them down in the floor, they will collapse and fall over. However, once something is on the bottom they stay upright pretty well. The panniers use Ortlieb's Quick Lock 2 mounting system, which is adjustable without tools. It comes with inserts that allow you to match the size of the hooks to that of your luggage carrier. It comes with 8 and 11 mm inserts. My luggage carrier has 10 mm rails, which means there is a bit of play. 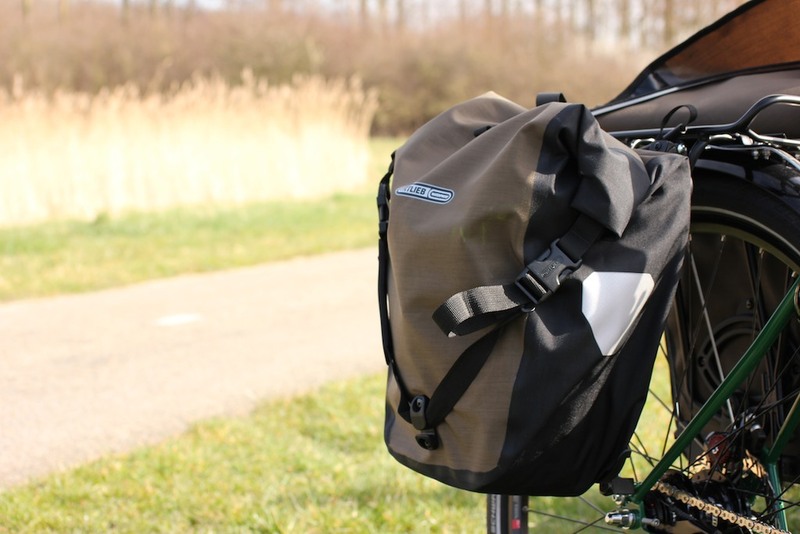 Some people have lost the inserts along the way, Ortlieb is now also selling bags with the Quick Lock 2.1 system in which they are more secure. Inside the bags there is one big compartment, and a document holder with on the front a zippered pocket. During our trips I kept papers like maps in there. The big compartment can be used for everything else. Some people prefer to organize things in smaller compartments, but I find a large pocket to be more flexible. Clothing and other items are easily organized in lightweight mesh bags. When borrowing a pannier to someone else they did lose the lower lid, but that was because they it was loosened and not properly tightened. 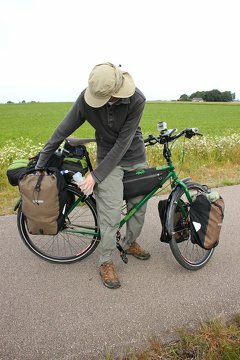 Ortlieb recommends to check and tighten the bolts regularly. Fortunately replacement parts are available, and the problem was resolved by spending a few euros for a new lid. Taking the bags on and off is as simple as pulling the handle. It can be more difficult to position them when there is something else on top of the luggage carrier, but that is more of a problem with the carrier than with the bags. Folding the top several times to close it, is slower than using a zipper. However, trying to close an overstuffed bag with a zipper can break it, so the rolling top seems like a more durable solution. You need to fold the top at least three times to make it waterproof. But in my experience you can get away with two folds for overstuffed rainy days. I wouldn't try submerging it though. The center strap keeps the bag closed, the outside straps make it water tight. You can strap them down in two ways, with or without the shoulder strap. I have grown to prefer the way without the shoulder strap. The strap can be buckled down using the shoulder strap. You can loop it on the top without the shoulder strap. The straps can also be used to tie down other stuff on top of the panniers. On our trip through Sweden I often kept my jacket, a bladder with water and a solar batter charger there. Refilling a bottle from the water bladder on top of the pannier. My jacket strapped on top of the pannier. The Front Rollers are pretty much the same as the Back Rollers. The major difference is that they each have a volume of about 12 liters per bag they are quite a bit smaller. They are intended to be mounted on a low rider, but there is no reason you can't use them as rear panniers. The same goes for the Back Rollers, they are larger, but fit equally fine on the front, being larger does give them less ground clearance, which could be a problem for bicycles with smaller wheels. But the difference in ground clearance with compared to the Front Rollers is not that big. One interesting difference is that the Front Rollers have a plastic plate on the back, this is good, because that is where the axle of the wheel is, which would otherwise rub against the Cordura canvas. The Front Rollers cost a little less and are slightly lighter, but only have 60% of the capacity, making them relatively heavy for the volume that they provide. Cycling with front panniers affects the handling of the bicycle. I found that I get sore wrists from lifting the front of the bicycle at the handlebar because it is so much heavier. 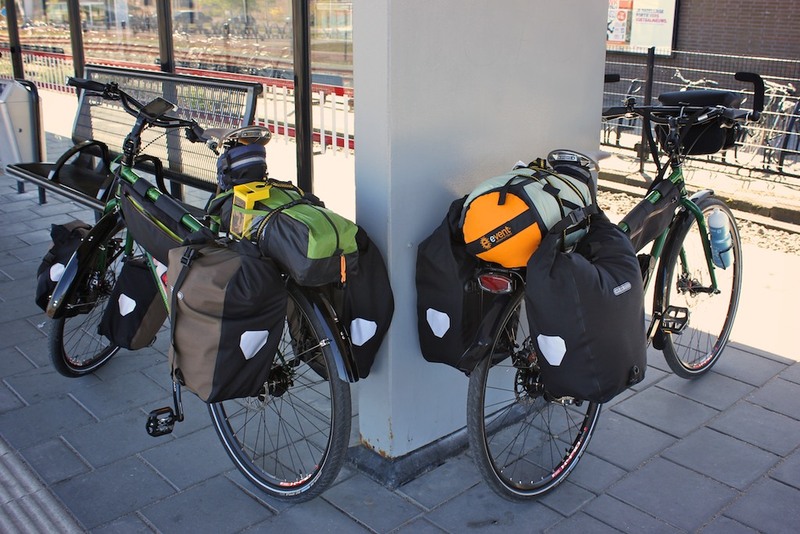 It is also much more important that the weight is equally distributed, and don't even think about riding with only a single front pannier, it will make the bicycle very hard to control. Considering this, I think the Front Rollers are less of a must have than the Back Rollers. 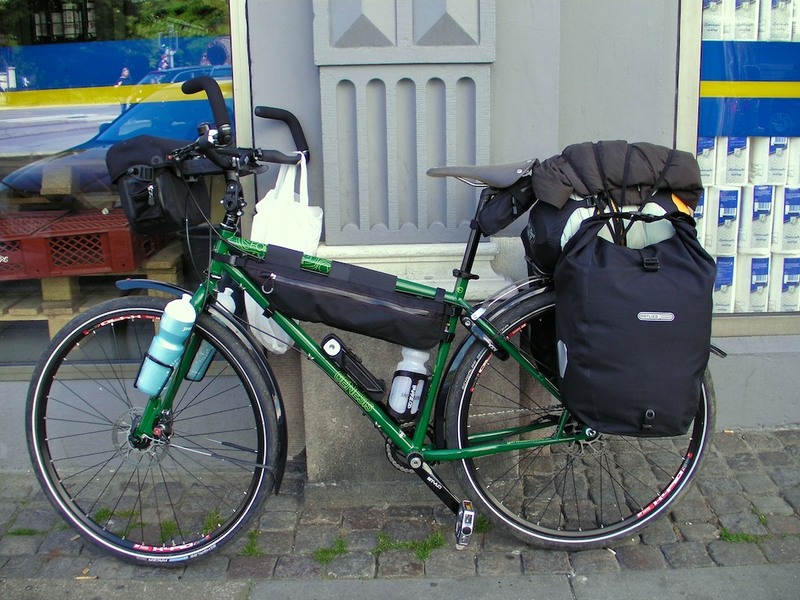 If you can put your stuff somewhere else without running into problems, don't bother with front panniers. This is why I only got one set, for my own bicycle, while my girlfriend carries water bottles on her front fork. Although sometimes we had to cram, it was mostly a matter of organizing the luggage efficiently, and we didn't need any extra storage volume for our trips. The Tubus Tara low rider rack with two empty Front Rollers already weighs more (1940 g) than two full bottles of water (~1600 g). If you need more storage volume than the 25 liters that the Front Rollers provide, a set of larger Back Rollers on the front may be a tempting option. Being a German brand repair kits, replacement parts and accessories are really easy to get in The Netherlands. It is the biggest brand for high end waterproof bicycle bags, around here. I would have liked to compare it to some other brands, but it's hard to find them. I have seen the Thule pack 'n pedal bags, but they are over twice the price, but have not been on the market long enough to be proven to be reliable, let alone that they are worth the price. 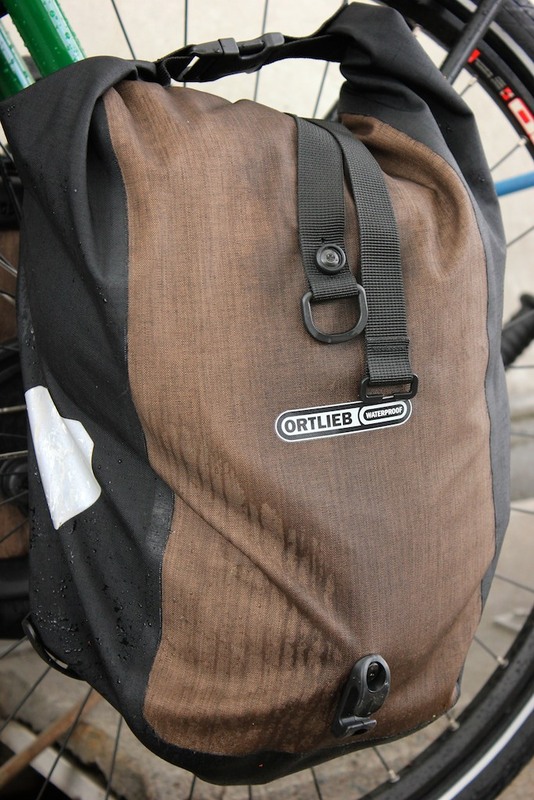 While the Ortlieb bags have lost their novelty, it is pretty clear what to expect from them. 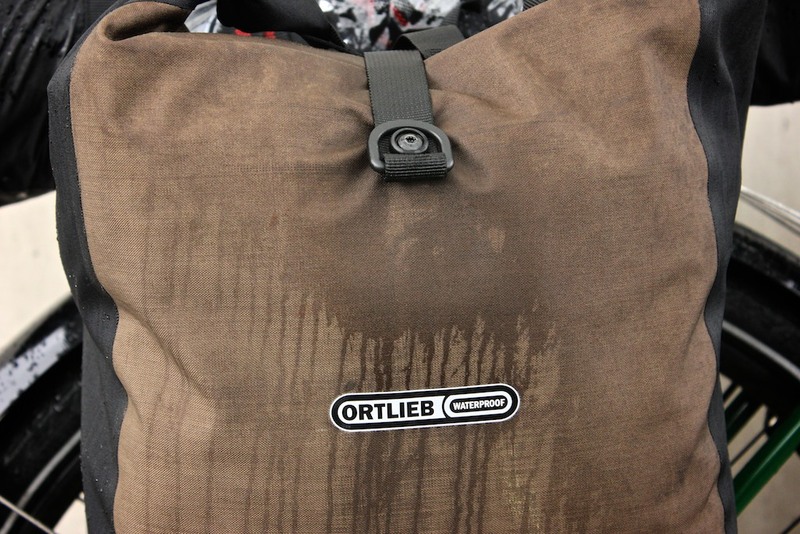 Some people don't like the Ortlieb bags because they don't have compartments to organize things in. Personally I prefer this, as I rather organize stuff with a variety of smaller bags, anything from breathing mesh bags to waterproof stuffsacks and disposable plastic bags. It is my experience that you often need to re-arrange things, as your clean clothes slowly move over to the dirty laundry bag and you carry varying amounts of food and clothing depending on what you are wearing. Another problem with bags with many compartments is that there is more stuff to break. I had a cheap bicycle bag with many compartments which had one broken zipper, the whole thing was pretty much useless after that. Zippers are not perfect for bags with stuff that you want to compress, first your stuff gets stuck in them, then they break if you try to close them anyway. 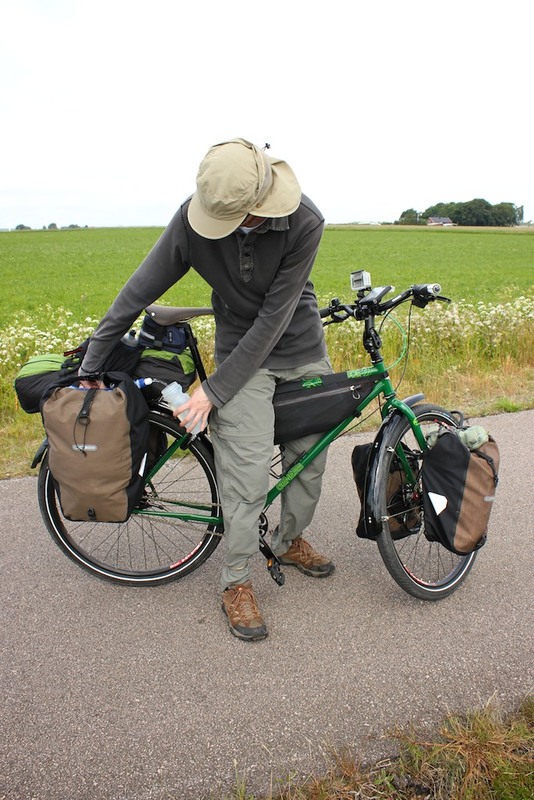 The panniers work well, so far they have kept my stuff on the bicycle and dry while it rains. The durability of the Cordura fabric impresses me. It seems thin and fragile at first sight, but I have scraped them along stone, wood, concrete and metal, and they still look good and have not got any holes. I like the ability to overstuff the bags, and the versatility of the straps. I do not regret getting the more expensive Plus version over the Classic or City. Bicycles on the trainstation in Steenwijk, Netherlands. 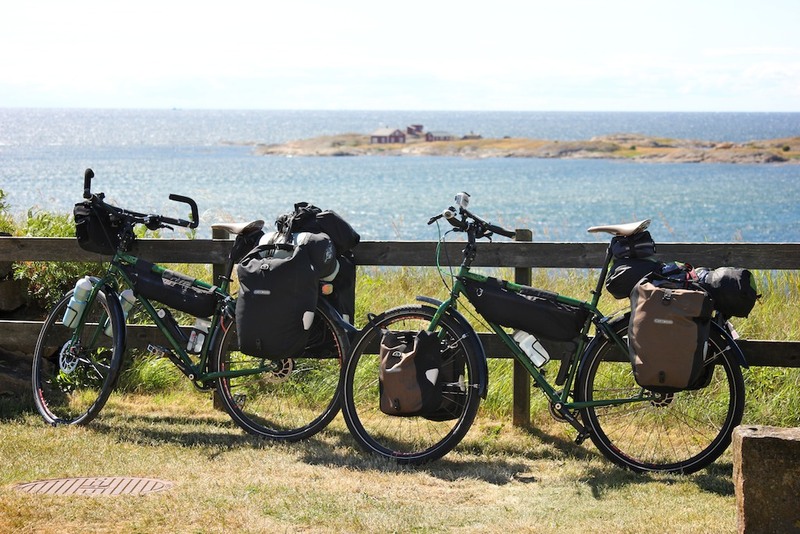 Bicycles near the coast in Varberg, Sweden.